At 12 o’clock sharp on Aug. 2, 1918 – one hundred years ago today –Vancouver transit operators stopped their streetcars in mid-route, drove them to the barns and walked home. The city’s normally bustling waterfront fell silent, as 2,000 burly stevedores and shipyard workers streamed from the docks. Construction workers refused to pound another nail or lift another brick. They joined textile and other union workers across Vancouver who were also leaving their jobs. It was the start of Canada’s first general strike and the beginning of one of the most memorable 24 hours in the city’s history. The mass walkout was timed to coincide with the funeral of miner, labour leader, union organizer and socialist Ginger Goodwin, shot dead less than a week earlier in the woods above the coal-mining community of Cumberland. 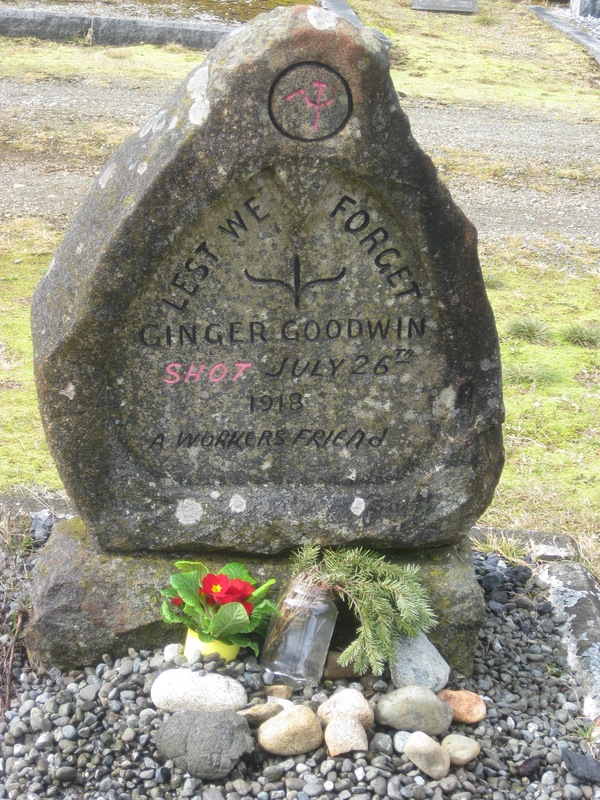 Goodwin, a former vice-president of the BC Federation of Labour, had been hiding out to avoid conscription to the killing fields of World War One, a war he and almost all segments of the BC labour movement vigorously opposed. With justification, they argued it was a pointless conflict that sent ordinary workers to kill each other, while politicians and leading citizens far from the fray thundered about patriotism, and the rich got richer on the profits of war. Goodwin had had his status suspiciously changed from “unfit to serve” to “fit”, after leading a strike for an eight-hour day at the large smelter in Trail. He was felled by a single shot from Dan Campbell, a special constable with a dubious background, who claimed he fired in self-defense. 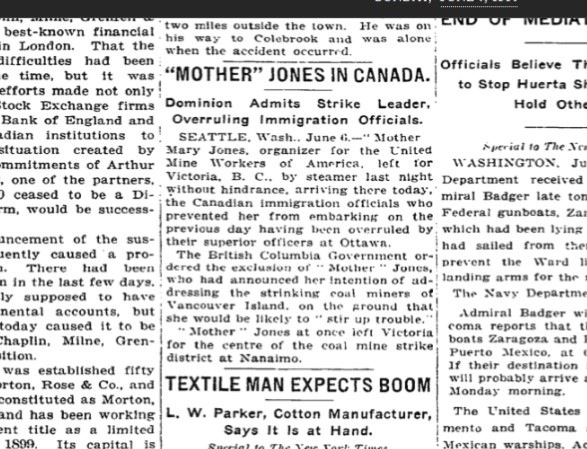 But the coal miners of Cumberland and the BC labour movement believed it was cold-blooded murder, and their rage was palpable. Campbell, later charged and acquitted of manslaughter, beat a hasty exit out of town to save his skin. Goodwin’s funeral procession was as large an event as the gritty, working-class community ever had. Headed by a brass band, the line of mourners accompanying Goodwin’s white casket to the cemetery stretched as far as the eye could see. Years ago, I interviewed a sprightly, life-long resident of Cumberland who remembered witnessing the poignant procession as a little girl. 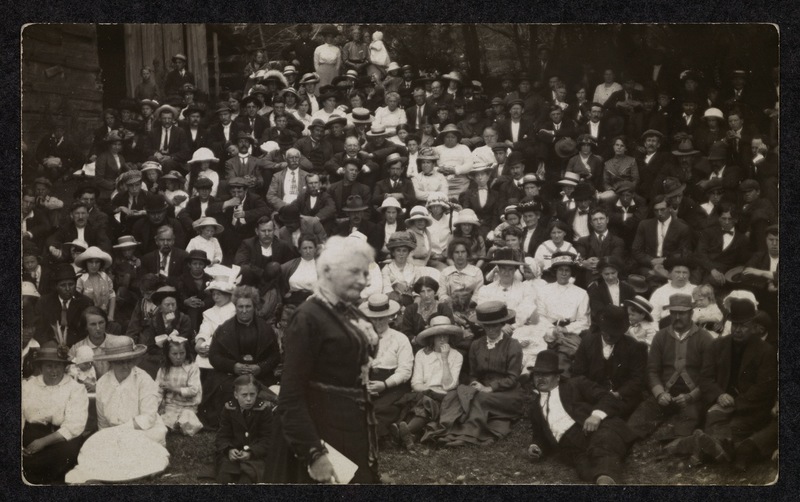 She recalled how much Ginger Goodwin, who spent several years in the mines of Cumberland, was admired by locals, for his fierceness in standing up for the miners’ cause during their epic two year strike from 1912-1914 and his prowess on the village soccer squad. “My father would never hear a bad word about Ginger,” she told me. It didn’t take long. That afternoon, a mob of several hundred ex-soldiers gathered outside the Labor Temple, which still stands at the northeast corner of Dunsmuir and Homer, its old lettering clearly visible over the entrance. After a few inflammatory “calls to arms”, they stormed through the doors and began ransacking Council premises. Books, documents, correspondence and other files were tossed out the window. Tables and chairs were trashed. On the second floor, they crashed through an office door to rush towards Council secretary Victor Midgley, who crawled out on the window ledge to escape their fury. 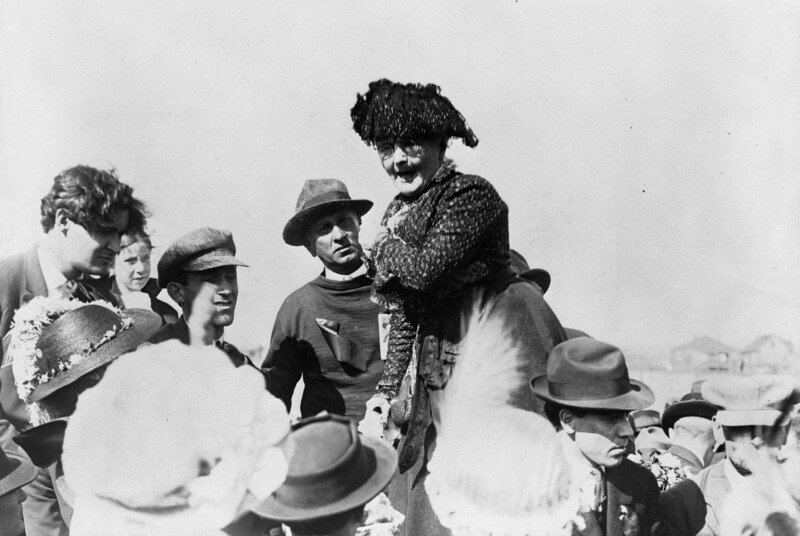 As they jostled to get at him, their way was blocked by courageous Frances Foxcroft of the Telephone Workers Union, who would not be moved. Then, it was off to the car barns to intimidate trolley drivers into resuming service, which actually happened shortly before midnight, and finally to a packed, rowdy public meeting of self-proclaimed patriots, where speaker after speaker were cheered for lashing out at Goodwin and local strike leaders. “They are just as bad as the man who got shot in the front or the back – I hope both” shouted one inflamed citizen, to a thunderous ovation. was a common sentiment. The lone attendee to vote against a resolution calling for them to be forced into military service overseas was physically ejected.. 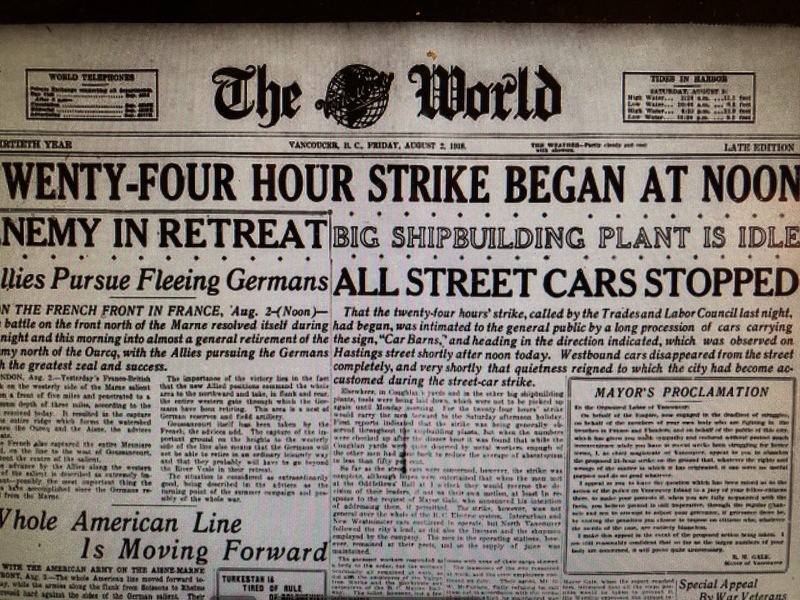 The next morning, with the waterfront still silent, the fired-up war veterans, still exulting over their “triumphs” of the previous day, decided to take on the longshoremen and force them back to work. It was not to be. This time, when they tried to assail the union hall ramparts at Pender and Hornby, they got a surprise. “Charging up a long set of stairs, they were met by longshoremen who beat them back using chair legs as staves,” wrote historian Irene Howard. A tense standoff ensued, until Mayor Robert Henry Otley Gale arrived. He convinced the agitated veterans to appoint a committee to talk to a longshoremen committee, ignoring their demand that the Labour Council’s Jack Kavanagh be ordered out of the city. The upshot was that the rioters marched off to the Cambie Street grounds, the dockyard workers returned to their jobs at a time of their choosing, and leaders of the Trades and Labour Council agreed to test the persistent accusation that the rank-and-file did not support the general strike by resigning and calling new elections. All but one or two were handily re-elected. By Monday morning, everyone was back at work, except for 50 shoe factory workers whose employer demanded they apologize for their Friday walkout before he would allow them back in. In the face of fierce intimidation, pro-war hysteria and mob violence, the remarkable success of the first general strike of its kind signified the increasing radicalism of the BC trade union movement, particularly in Vancouver. Less than a year later, the city’s unions walked out again, this time for an entire month, in a sympathy strike to back the 1919 Winnipeg General Strike. The horrors of World War One and the failure of rampant capitalism to deliver any kind of economic justice to those who did the work led more and more unions to embrace socialism as the only alternative to a broken system. Ginger Goodwin would have understood. It has been a terrible year. Bowie and Prince taken far too early. Leonard Cohen leaving us to mourn and light candles against the dark. Long-time friends battling serious health issues. Fake news, the decline of newspapers and the mainstream media, more necessary than ever to hold governments and politicians to account. An antiquated electoral system, an FBI “announcement coup” against Hillary Clinton and Russian hackers delivering a sniveling, bullying, thin-skinned, shallow-thinking prima-donna with the attention span of a child to the White House, while the most adult of U.S. presidents takes his dignified leave. Terrorism in Europe. Aleppo. And now, to cap off this annus horribilis came news of the passing of Peter Comparelli, as lovely a person as there ever was in the tough, crazy world of journalism. Beyond being a wonderful fellow and someone to enjoy a beer or five with, Peter had a special place in my heart, as the guy who took over my beloved spot on the labour beat at the Vancouver Sun. He thrived on it. A few years later, when I joined the rival Province as that paper’s labour reporter, thirsting to kick the slats out of the Sun’s coverage, I had a hard time harbouring any ill-will towards my good friend, Comparelli. In fact, one of the best times either of us ever had on the beat was getting to cover the international convention of the Brotherhood of Teamsters in, where else, Las Vegas. We were both sent because it was a good local story. A band of feisty Vancouver dissidents had managed to get elected as delegates, and they were determined to raise the banner of reform against the organized thuggery of the big, bad, beefy Teamsters. If that embarrassed Vancouver’s own Senator Ed Lawson, the smooth, highly-paid presider over the Canadian section of the union and an international vice-president, all the better. And they did cause a ruckus, most notably when feisty B.C. truck driver Diana Kilmury stood on the convention floor, braving the intimidating howls of several thousand male, mostly large, delegates, and denounced the Teamsters for all the criminal indictments amassed against their leaders. “I didn’t indict you,” Kilmury shouted into the mike. “But if the FBI has issued that many indictments, you must be up to something!” (In fact, then president Roy Williams was eventually sent to prison for his connections to organized crime. His prominent partner at the head table and successor, Jackie Presser, avoided going to jail only by dying of cancer.) But beyond all the great copy, and the fascination of seeing the Teamsters operate up close, with the ghost of Jimmy Hoffa hovering over them, it was a delight just to hang out in Vegas with Peter. We coughed up small amounts of money in the casinos (more by Peter, of course… ), bathed in the neon sun that banished night along the strip and spent our expense money. It doesn’t get much better than that. Comparelli eventually moved on to cover the legislature. Then, to everyone’s surprise, off he went to sample the delights of life and journalism in Hong Kong, never to return. But, as the spontaneous outpouring of love and affection for Peter on the Pacific Press Facebook page attests, he was not forgotten in Vancouver, even after 30 years away. Apart from his cracker-jack reporting, he was a union shop steward when those positions mattered, an exceptionally able catcher on the Sun’s competitive softball squad, teaming up with ace pitcher Kelly Evans to win so many games, and an embracer of the good times life had to offer, someone you were always glad to see. Former Sun reporter Debbie Wilson, who had decamped to Mexico, noted how grateful she was when Peter suddenly turned up, amid the ruins of the 1985 Mexico City earthquake. “He was dispatched by the Sun to cover the disaster and also to find me, as I was (unknown to me) MIA.” With an innate ability to love and attract women, he broke some hearts, it must be owned, until finally meeting his match and marrying Idy. At his wedding reception in Vancouver, I had never seen him happier and more assured that he was doing the right thing. He worked for Asiaweek in Hong Kong, was their correspondent in Kuala Lampur, became a skilled editor, then bounced around with other publications and jobs, till it became hard to keep track. But it was in Hong Kong where he was most remembered, a regular at the city’s legendary Foreign Correspondents Club, along with other refugees from the Vancouver Sun who washed up in Hong Kong. Der Hoi-Yin, Jake van der Kamp and the irrepressible Wyng Chow were particularly close. Peter’s last trip back to Hong Kong, from his permanent home in Penang, had been in May. But Wyng Chow had been in touch with him only a few weeks ago. Though a bit less chipper than usual, with his experimental anti-cancer drugs proving difficult to manage, Wyng said Peter talked of returning for yet another reunion. News of his death was a shock. He died, at 63, from lung cancer, surrounded by Idy and his three brothers. Farewell, Peter. We loved you, man. Thirty-three years ago, the newly-relected Social Credit government of Bill Bennett brought down the most dramatic, yay outlandish, budget and “restraint” package in B.C. history. What happened next is detailed here in an essay I wrote a year or so ago. On July 7, 1983, Bill Bennett and his Social Credit government, freshly elected to a third successive term in office, unleashed a revolution in British Columbia. This was a revolution from the right. Fueled by the radical conservatism of Ronald Reagan and Margaret Thatcher and Milton Friedman’s economic neo-liberalism, the Socreds took aim at all those elements in society they had never liked. With no advance notice, a total of 26 repressive bills came down the chute in a single day, along with a harsh government restraint budget that dramatically slashed social spending. Rent controls were abolished. Landlords were given the right to evict tenants without cause. The Human Rights Commission was shut down, its workers fired on the spot. The Employment Standards Branch was killed off. Scrutiny of Crown corporations was wound up, while the government tightened its grip over local school board budgets and community colleges, including course content. And on and on. The worst of the onslaught focused on workers and unions in the public sector. Under Bill 2, they lost the right to negotiate almost anything except wages and benefits, even as wage controls were extended indefinitely. Bill 3, designed to pave the way for a wave of firings, wiped out job security and, incredibly, gave all public sector authorities the power to terminate workers without cause, regardless of seniority. (The first list of government employees to be fired included the names of B.C. Government Employees Union executive members John Shields and Diane Woods.) This was, indeed, “Black Thursday”. The legislative barrage came at a dire time for the labour movement, already weakened by yet another NDP defeat at the polls and the sudden death earlier that year of Jim Kinnaird, the tough, able Scot who had headed the B.C. Federation of Labour since 1976. Kinnaird’s stopgap successor was Art Kube, a portly, relatively unknown, Canadian Labour Congress staffer with little real union experience. Yet the fightback was immediate and intense. In fact, there has never been anything quite like the concerted Operation Solidarity protest that swept the province through four turbulent months during the summer and fall of 1983. The popular, union-led uprising against Premier Bennett’s Restraint Program brought B.C. to the verge of a general strike, involving hundreds of thousands public sector workers, with B.C.’s powerful private sector unions waiting to join in the moment anyone was punished for walking off the job. Resistance was further powered by an unprecedented coalition between the labour movement and community advocacy groups that had seen so many of their own rights trampled. Kube, his belief system forged in the social democracy of his native Austria, was to prove an adept leader and strategist, who steered this unlikely coalition until the wheels fell off at the very end. George Hewison of the Fishermen’s Union was first off the mark. He called a meeting. Instead of the usual suspects, more than a hundred people showed up. They decided to hold a demonstration. Two weeks later, 20,000 people marched across the Georgia Viaduct. The rally featured IWA leader Jack Munro’s enduring observation on whether the numerous protest signs referring to “fascism” went too far. “If it looks like a duck, and it walks like a duck, then it’s probably a goddamned duck!” he thundered. The crowd roared back. Kube soon coordinated union action, bringing Fed affiliates and their bitter, independent Canadian union rivals together for the first time, under the banner of the astutely-named Operation Solidarity. Social activists also threw themselves into the struggle. A myriad opposition groups sprang up. One left-wing lawyer complained his practice was going to seed. “All I do is go to meetings.” Kube harnessed this activism into a separate Solidarity Coalition, hired several organizers, funded the rambunctious Solidarity Times newspaper, and convinced the Coalition they were equal partners with the protest’s potent trade union arm. Demonstrations and wildcat strikes, including a lengthy occupation of the Tranquille mental health facility in Kamloops, soon spread throughout the province. Twenty-five thousand swarmed the lawn of the legislature. Elsewhere, even in Social Credit strongholds, protestors rallied in the hundreds and thousands. But nothing topped the day tens of thousands public sector workers booked off and crammed every nook and cranny of Vancouver’s Empire Stadium. Just when it seemed the old stadium was completely jammed, in marched hundreds of uniformed firefighters, led by their famed marching band. It was a chilling, emotional moment that no one who was there would ever forget. Hope and optimism were in the air. But Bill Bennett refused to buckle, deriding protestors as losers re-fighting the last election. Despite heroic, marathon efforts by NDP MLAs to stall the legislation, one by one the bills were pushed through. Solidarity leaders gambled on one more demonstration, this one in mid-October, organized by the Coalition. The turnout stunned those on both sides of the battle. An estimated 80,000 demonstrators thronged the downtown streets of Vancouver. It remains the biggest protest in the city’s long, stormy history. It was time to move to the picket line. Solidarity hatched a war plan, calling for a series of escalating public sector walkouts, culminating in an all-out general strike. Two weeks after the huge October protest, 40,000 members of the BCGEU walked off the job – legally – while their negotiators demanded the turfing of Bill 2 and an exemption from Bill 3. A week later, thousands of public school teachers and other education workers defied the law and hit the bricks on an illegal strike, seeking similar job protection. Municipal employees and the province’s critical ferry workers were next in line, set to strike on Monday, Nov. 14. Finally, the government got nervous. They began to talk seriously about issues that had inflamed B.C. for months. Norman Spector, Bennett’s right hand man, parachuted into round-the-clock bargaining with the BCGEU at the B.C. Labour Relations Board. Spector also met secretly with B.C. Federation of Labour heavyweights Jack Munro and Mike Kramer. The end came in a series of dramatic events that concluded less than 12 hours before the threatened ferry workers’ strike. The BCGEU won a deal containing wage increases, the death of Bill 2 and a Bill 3 exemption that recognized layoffs by seniority. It was a victory of sorts, and BCGEU negotiators brought out the champagne at their union headquarters in Burnaby. It was now a union show. The Solidarity Coalition and its causes, which had been such a part of the four-month protest, were shunted to the sidelines. “How can they celebrate when they’re selling out human rights?” lamented one Coalition leader, bitterly. But before the picket lines came down, Operation Solidarity still wanted a pact with Bill Bennett to confirm their limited gains. With Kube home sick, Jack Munro flew to Kelowna to “negotiate” with the Premier. Sensing Solidarity’s desperation, however, Bennett refused to make any public statement committing the government to anything. Over the phone, Kube told Munro to “get the hell out of there”. Munro stayed. With the unanimous support of Federation executive members back in Vancouver, he soon stepped onto Bennett’s darkened porch and announced an end to Solidarity’s magnificent movement. Not with a bang, but a whimper. Privately, the government agreed to Bill 3 exemptions throughout the public sector, keeping money saved by the teachers’ walkout in the education system, and consultation on a few social matters. Yet this seemed a pittance to those who had had such high hopes for so many months. Instead of a victory celebration, there was bitterness and confusion. People felt betrayed. Operation Sellout buttons became popular. Jack Munro was vilified, both inside and outside the trade union movement. Perhaps it was unrealistic to expect union members to strike and sacrifice their own pay cheques for non-monetary, non-union social issues. But this was never articulated to the Solidarity Coalition, which was left out in the rain by the final agreement. In the cold light of dawn, however, there were still significant achievements to be noted. Nowhere in Canada outside Quebec had a strong, militant labour movement been able to stop a government’s anti-union agenda in its tracks. In the end, after all its bluster, Social Credit completely capitulated on Bills 2 and 3. That clear triumph is often forgotten amid all the unhappiness over the so-called Kelowna Accord. Bennett, himself, was heavily damaged politically. He chose not to run again. The extent of the historic fightback also dampened public enthusiasm for his right-wing, neo-con Restraint Program, few elements of which survive today. It also ensured Bennet would never be hailed a conservative folk hero, except perhaps by the Fraser Institute, as were Ronald Reagan and Margaret Thatcher. For all of that, we can thank Operation Solidarity. And the Solidarity Coalition. For some reason, Bill Bennett seemed to like me. In the few times we encountered each other, we got along. Goodness knows why, since, as a labour reporter, I had little time for the wealth of anti-labour legislation that came down the legislative pipe during Bennett’s 11 years as premier, topped by his outlandish, 26-bill “restraint” package in 1983. It went far beyond “austerity”. One of the bills gave his government the right to fire public sector workers without cause and lay them off without regard to seniority. Among the first to be shown the door was BCGEU vice-president Diane Woods. Nor was that all. On that single unforgettable day, the government also wiped out the Human Rights Commission (employees fired on the spot), gave landlords the right to evict tenants without cause, abolished rent controls, severely curtailed employment standards, tightened government control over school boards, community colleges and course content, weakened public scrutiny of Crown corporations, slashed social spending, and announced the layoffs of hundreds of government employees. It was a neo-con revolution of the right, hailed by the Fraser Institute and the Milton Friedman folks in Chicago. “Black Thursday” led to the most concerted protest fightback in the history of B.C., bringing the province to the verge of an all-out general strike. Er…where was I…? Oh yes, Bill Bennett and me. As I said, all my dealings with Bennett the Younger were cordial, even friendly. I particularly remember one strange Friday night in the good old days when there were labour reporters. I was working the night labour beat at the Vancouver Sun, looking forward to a drink later on at the Press Club across the street. Out of nowhere, the “labour desk” got a call from one of Bennett’s aides, saying the Premier would like to have dinner with me. But of course. Why wouldn’t he? So out I headed on that dark and stormy night to a Japanese restaurant in deepest Richmond. And there he was, leader of all the people, dining out with a few of his cronies. It was such a simpler time. Turned out the Premier wanted to talk to me about what he intended to do to ensure there would be no repeat of a bitter ferries strike that had just convulsed the province. His plan involved curbing the powers of the quite wonderful Labour Relations Board established under the NDP, and broadening the definition of essential services. We had a pleasant conversation. I drank green tea and took notes. Bennett didn’t seem to mind my defense of the LRB and its brilliant chairman, Paul Weiler. Nor did he seem perturbed when I pointed to a strike-ending document authored by Mr. Weiler that, among other things, ruled out another aspect of Bennett’s agenda: potential prosecution of ferry workers for defying a back-to-work order. It was actually kind of odd, as I realized little old labour reporter me knew more about the ins and outs of the ferry dispute than the premier of the province. But never mind. When I got back to the office, I had a big scoop that was splashed all over the front page of the Saturday Sun. Nor was that the end of this gripping, personal saga. A few days later, Bill Bennett had to stand up in the legislature and acknowledge that he may have misled the House, after an article by that same little old labour reporter me contradicted something he had said. It’s all a bit complicated and picayune, but here is my shiny Bill Bennett moment. MRS. E.E. DAILLY (Burnaby North): To the Premier. Was the Premier aware of the Weiler document the evening before he went on public television? COCKE: Rod Mickleburgh says he showed it to you the night before and you talked to him about it the night before. HON. W.R. BENNETT (Premier): Mr. Speaker, I rise on a point of clarification…to clarify an answer made in question period yesterday. HON. MR. BENNETT: Mr. Speaker, I must say that in answer to a question from the member for Burnaby North (Mrs. Dailly) yesterday, in the shortness of my answer I may have inadvertently misled the House. The question was: was I aware of the LRB document? The answer would have to be yes, but I had not read the contents. That was the way I had understood the question. But I would point out that I did attend in dinner with Mr. Mickleburgh, who was there to receive a statement in advance of my press conference the following morning, and he has suggested that he mentioned the document during the dinner. While I cannot recall the contents of what he said, it must be said that I was aware that the Labour Relations Board did have a document. For that the answer would be “yes.” Had I read it and did I know the contents? The answer would be “no” at that time. For the only time in my mediocre career, the score stood: Mickleburgh 1 Premier of British Columbia 0. We encountered each other a few times after that, all private, all rather enjoyable. He never mentioned my calling him to account. Unlike many other politicians, Bill Bennett, frequently a target of intense media criticism, never held a grudge against reporters. Former Province legislative columnist Allen Garr, who wrote a hard-hitting book on Bennett called Tough Guy and was never easy on him in his columns, said he ran into the former premier a few years ago and was greeted with a genial ‘hello”, warm handshake and heartfelt pleasantries. Mind you, Bill Bennett shook hands with anybody…. Even his family’s paid obituary in the newspaper referred to Bill Bennett’s competitive fire, which hardly diminished as he grew older. At 68, nearly 14 years after he resigned and slipped back to a secluded, private life in Kelowna, Bennett was summoned to testify at the inquiry into the legendary Bingogate scandal. The inquiry was called to look into the illegal redirection of charity bingo funds by NDP stalwart and former cabinet minister, Dave Stupich. Asked about a mysterious memo that suggested Bennett somehow called off an investigation into Stupich’s charity bingos, the former premier denied even knowing about the matter. “Quite frankly, rest assured I never went out of my way to save Dave Stupich from himself,” he asserted, much to the merriment of those attending. Later in his testimony, the great “Scotch and cornflakes” saga came up. Stupich had intimated in a letter to his constituents that Bennett was a heavy drinker, known to pour a bit of Scotch on his morning cornflakes. When Stupich refused to retract, Bennett sued. Stupich, along with his cohort, former Attorney-General Alex Macdonald, thought there was great political sport to be made, and fought the matter in court. Bennett, of course, didn’t fool around. He hired the best libel lawyer in the province, and was awarded $10,000, a hefty sum in those days. “Mr. Stupich didn’t plead truth. He tried to play political. I can only suggest he either got poor legal advice, or no legal advice,” the 68-year old Bennett told the inquiry. 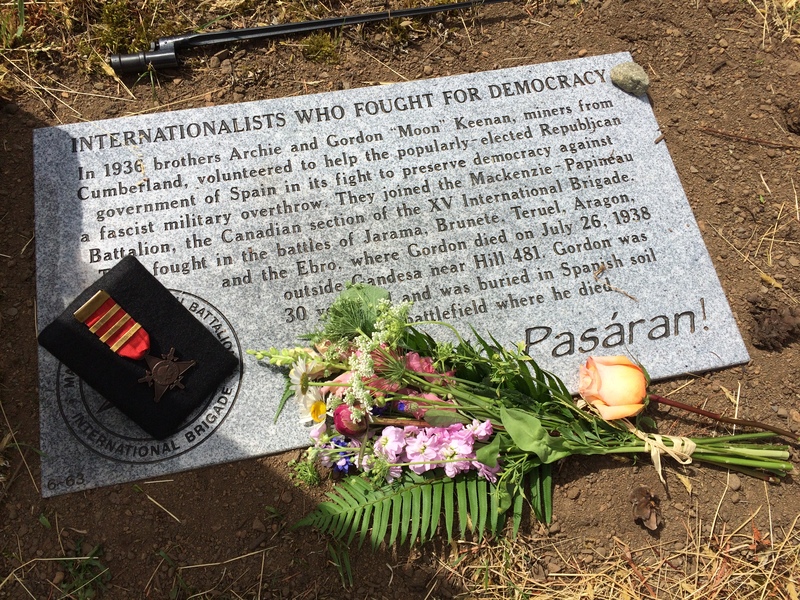 CUMBERLAND AND THE SPANISH CIVIL WAR. NO PASÁRAN. I have more than a few books about the tragic Spanish Civil War. Yet I can barely bring myself to read them. Well, except for Homage to Catalonia, George Orwell’s bittersweet, affecting memoir detailing both the heroic commitment of those who fought for a republican Spain and the bloody witch hunt by hard-line Stalinists against those fighting with the anarchists. I just find it all so depressing. In addition to the millions of Spaniards caught up in the ferocious struggle, thousands of young idealists from all over the world headed off to Spain, fired by a zeal to fight fascism and support a democratically-elected government that sought to make progressive change. The issues could not have been more black and white. The conflict has been rightly labelled ‘the last great cause’. It ended, of course, in disaster, an aching reminder that the good guys don’t always win. With the fall of Barcelona and then Madrid in 1939, Franco’s goose-stepping, fascist forces, backed by Hitler, Mussolini and the hierarchy of the Roman Catholic Church, were triumphant. Western countries had done nothing to support the Spanish Republic, while Hitler’s Luftwaffe bombed and strafed soldiers and civilians at will, with nary a peep of protest from “the democracies”. In fact, many countries, including Canada, even made it illegal for their citizens to fight on behalf of the Spanish government. After they returned home, they were blacklisted, harassed and often jailed for their bravery, labelled as “premature anti-fascists”. 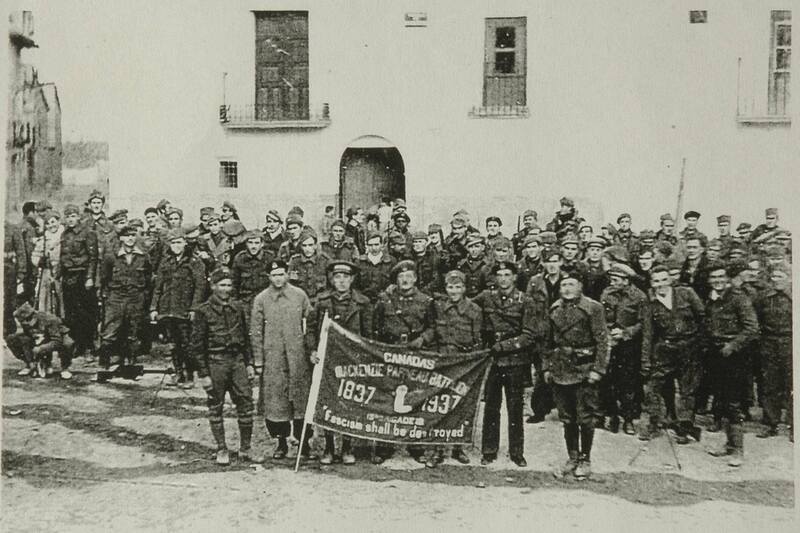 More than 1,500 Canadians defied their government to fight in Spain, their idealism and radicalism forged by the economic hammering they’d taken during the Depression. Of the 50 or so countries whose nationals fought in Spain, Canada had the second highest proportion of volunteers, after France. They formed their own fighting force, the famed Mackenzie-Papineau Battalion, and their blood ran deep in the soil of Spain, as many as 400 killed or missing in action. One of them was Allan Howard, the older brother of Jack Howard, who was married to our “Auntie Irene”, not a blood relative but an aunt in every other way. Three of the Mac-Paps were coal miners from Cumberland, my favourite town in all the land: Arthur Hoffheinz, and the Keenan brothers, Archie and Gordon, who was universally known as “Moon”. They had a tough time. Captured by the Falange, Hoffheinz was held as a prisoner until well after the war ended. 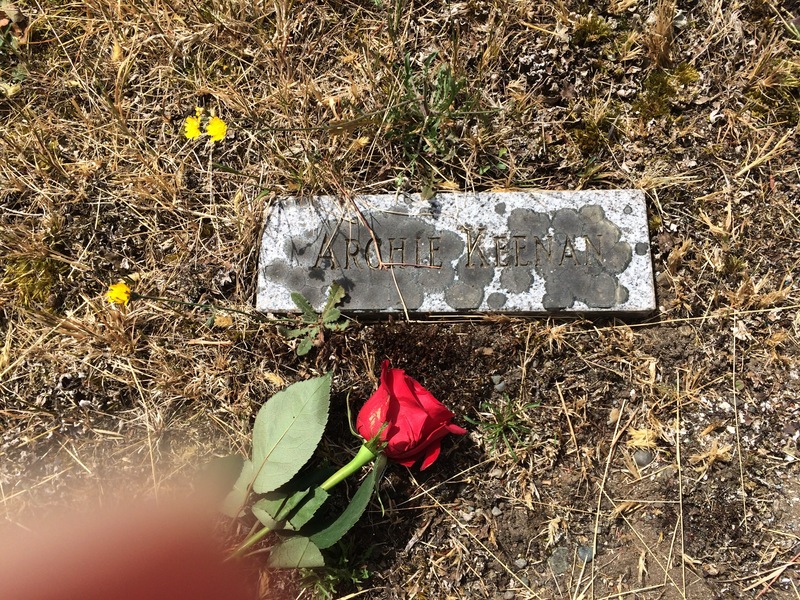 Archie Keenan came back early, and Moon Keenan was killed during the critical Battle of the Ebro, a disastrous defeat that basically sealed the fate of Republican Spain. He was 30 years old. 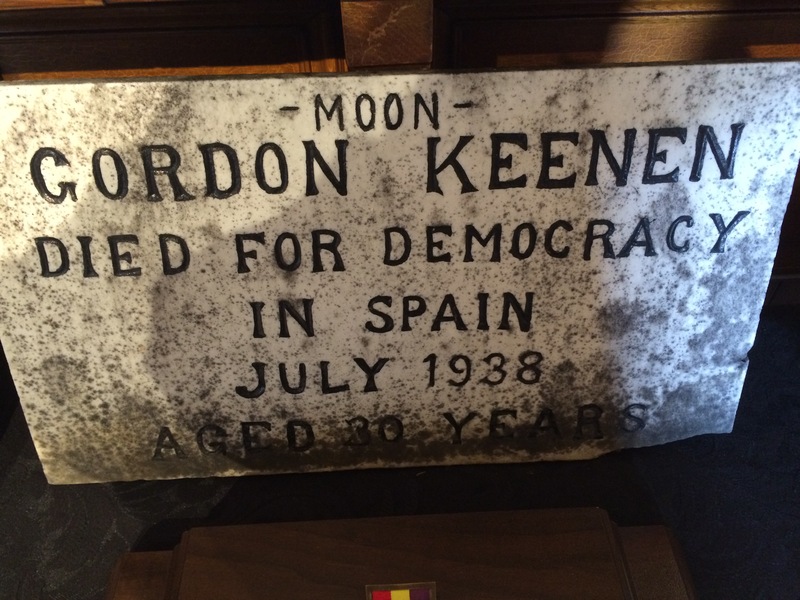 For years there was a plaque in the Keenan family plot in Cumberland, attesting that Gordon “Moon” Keenan “died for democracy in Spain”. Last month, during the community’s annual Miners’ Memorial Weekend to commemorate labour martyr Ginger Goodwin, a special ceremony was also held to mark the sacrifice of Moon Keenan. As a colour guard of flag-carrying, black vested fellows wearing red shirts stood at attention, the Last Post sounded, its last, lingering notes hanging over the silent graveyard. (Photo courtesy of the Comox Valley Record). There were speeches. Archie Keenan’s grandson, and Moon’s grand-nephew, spoke for the family. “They were my grandfather and great uncle,” he told us. “There was a little bit of a rabble-rouser in them, and they went to Spain to help out. For that, I salute them.” Beside the tomb of the Keenan boys’ parents, a new, more detailed plaque was unveiled for Moon Kennan. 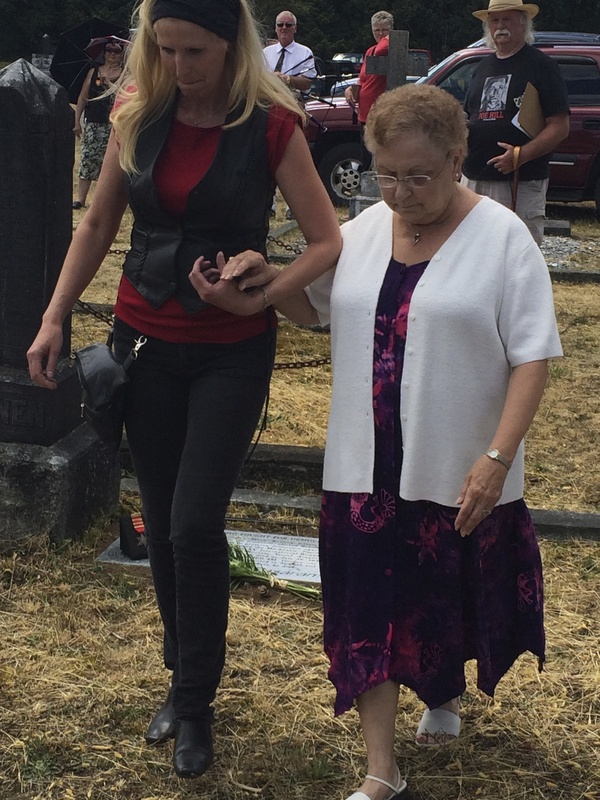 Several surviving relatives, one of whom was overcome with emotion, laid flowers. On the other side of Moon’s plaque was a simple marker for his brother, Archie, adorned by a single rose. 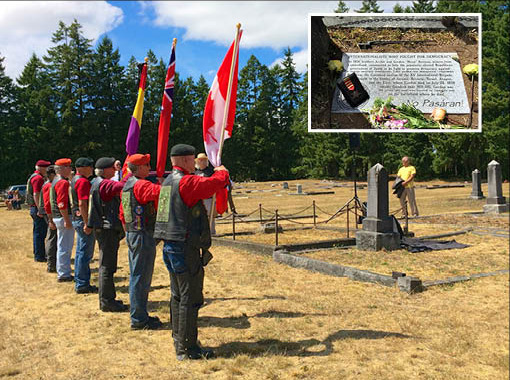 Attitudes to the Mac-Paps eventually softened as the old volunteers grew old and died, although they have never been recognized as veterans by the Canadian government. There are now monuments to their heroism in the legislative precincts of Victoria, Toronto and (gasp) Ottawa – thank you, Adrienne Clarkson! Jules Paivio, the last surviving veteran of the Mackenzie-Papineau Battalion, died in 2013. May God bless them all.